The ULTRATONE K3000FX specializes in clean, powerful sound. 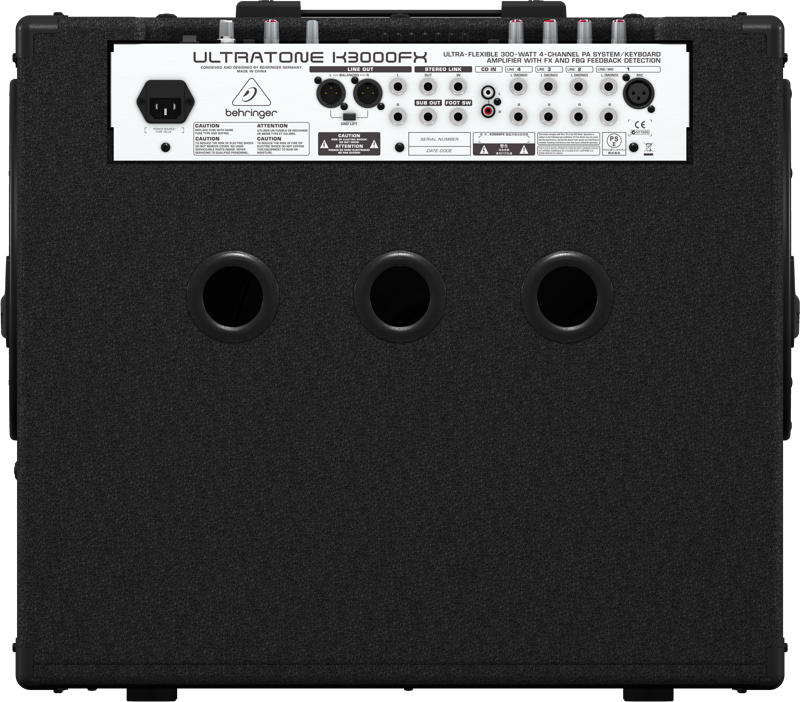 With this 300-Watt workhorse in your rig, your keyboards will sound their best gig after gig. 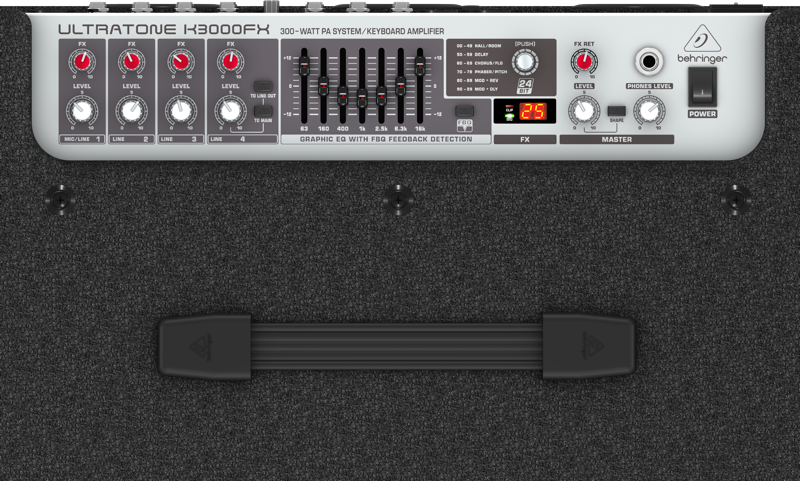 The 300-Watt K3000FX gives you four stereo channels, each with separate volume and FX SEND controls, plus Channel 1 has an additional XLR mic input for direct connection of a dynamic microphone. So, if you're the kind of keyboardist with multiple instruments at your disposal, the K3000FX is ready to handle up to four independent signals. It is also ideal for use as an all-in-one solution for keys and vocal applications. The onboard 24-bit digital FX processor, with 100 amazing presets, adds a high-tech dash of reverb, chorus, flange, delay, pitch shift and other effects to your sound. The MAIN Section gives you separate controls for FX RETURN, MASTER VOLUME, PHONES and SHAPE. A CD INPUT allows you to play recorded music through the K3000FX during performance breaks, or just for playing along. A separate headphone output is perfect for quiet practicing. The K3000FX also features an integrated 35-mm pole socket for stand mounting and use as a PA system. The line output for direct connection to your mixing console makes it a perfect fit for an existing PA system as well. A 15" BUGERA woofer, made completely in-house by our own skilled artisans, works in connection with a custom-made 1.0" driver for awesome, full-range sound. 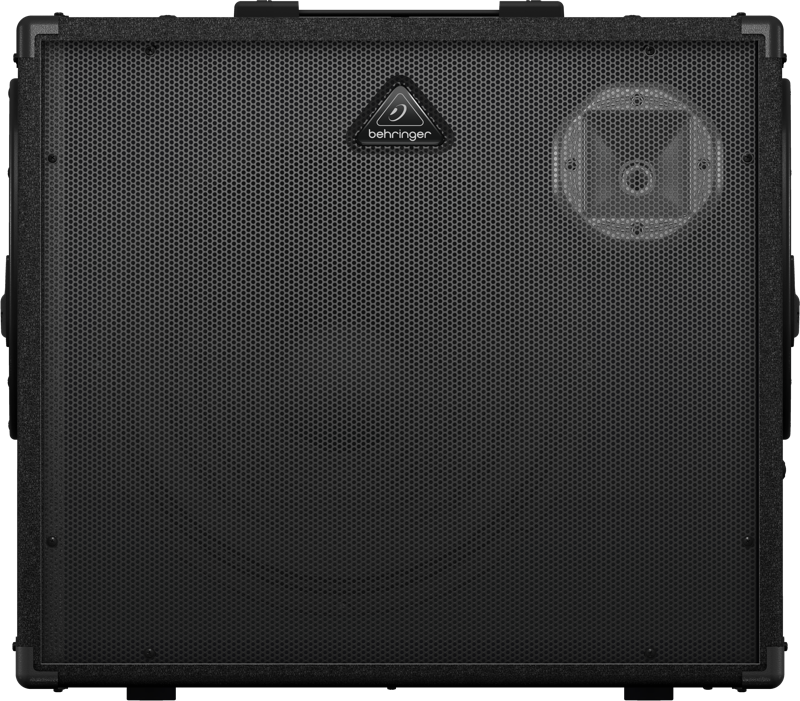 The K3000FX also features a subwoofer output, as well as a LINK output for connecting to an additional amplifier. A pair of K3000FX amps makes an extremely versatile and portable stereo system. Use the K3000FX to bring out the best in your sound via its 7-band graphic EQ with our proprietary FBQ Feedback Protection System. This incredible audio solution immediately pinpoints frequencies that cause feedback, so you get perfect sound every time. Versatility, incredible sound and durability merge beautifully in the K3000FX. Check it at your nearest BEHRINGER dealer to find out what it can do for your sound.